NRM ‘rebel’ MPs thrown out of Parliament - Western Uganda's Biggest radio. The Constitutional Court has ruled and ordered that the four NRM ‘rebel’ MPs be thrown out of Parliament . Justice Richard Buteera ruled that the legislators’ stay in the House is unconstitutional since they were expelled from the party. Judge Faith Mwondha described the NRM Rebel Mps as “politically wild aliens” with no place in parliament adding that the ‘rebel’ MPs left the NRM voluntarily. Just like Justice Richard Buteera and kavuma, Justice Mwondha ruled that the NRM rebel MPs be kicked out of parliament saying that the Speaker acted unconstitutionally, by allocating them new seats. 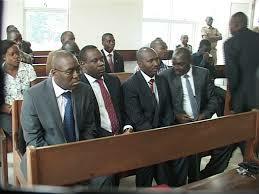 The four legislators are Theodore Ssekikubo, Mohammad Nsereko ,Wilfred Niwagaba and Barnabas Tinkasimire .